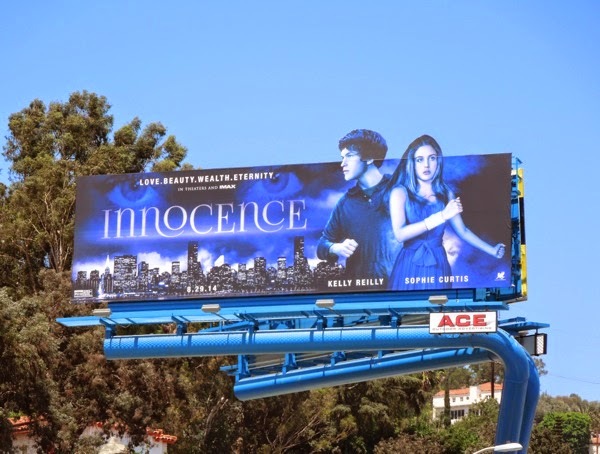 Today's billboard feels like it's from a much more innocent time, in fact it actually feels like it's been ripped from the late 90's and almost has a dated Buffy the Vampire Slayer quality to it (and not in a good way). 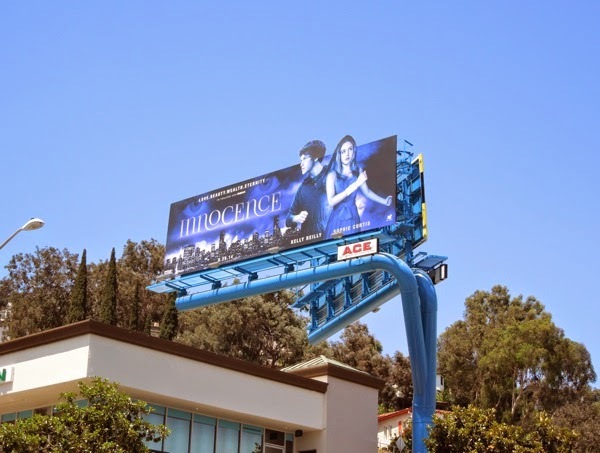 Innocence is the latest young adult adaptation to hit the big screen, based on the 2000 gothic fantasy novel of the same name by Jane Mendelsohn. After the death of her mother in a surfing accident, a young girl named 'Beckett' (Sophie Curtis) enrolls at an elite Manhattan preparatory school, where she discovers love (in the form of The Good Wife's Graham Phillips) and the dark secret that the coven of women running Hamilton (including Kelly Reilly) perpetuate their eternal fountain of youth by drinking the blood of virgin sacrifices. 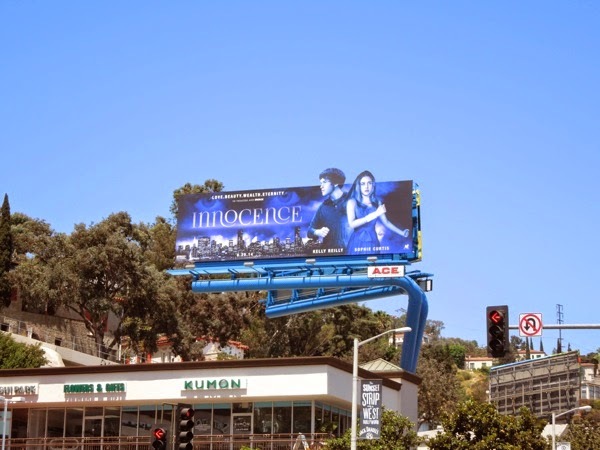 The special extension billboard for Innocence was first snapped along L.A.'s Sunset Boulevard on July 16, whilst the square ad version was photographed further east along the Sunset Strip on July 20, 2014. 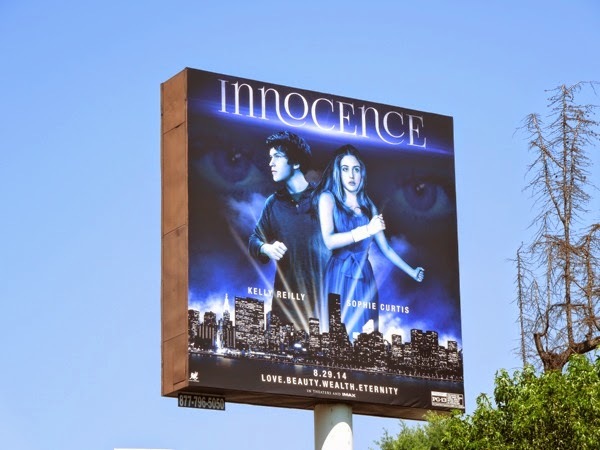 The blue tint on the ad creatives really gives them an old school quality, plus it doesn't help that the young actors look really wooden and unnatural in their poses. And don't get us started on that old visual horror trope of the haunting eyes in the background. 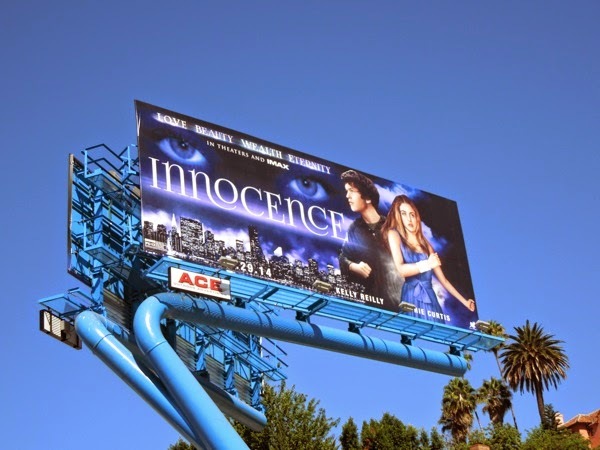 These outdoor ads remind Daily Billboard of another young adult book adaptation from around this time last year, The Mortal Instruments: City of Bones, which also sported an old-fashioned ad creative and look at how well that performed. 'Nuff said. 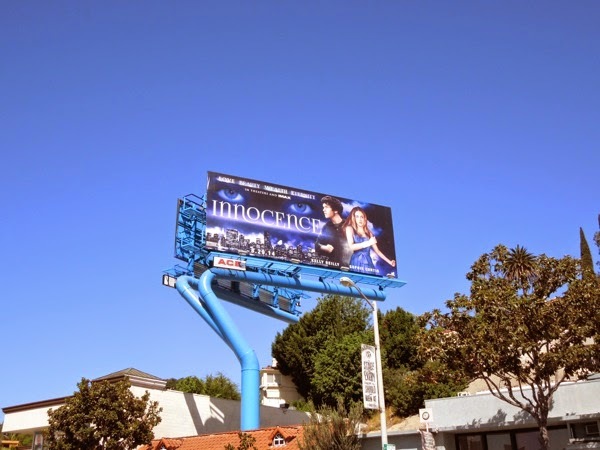 UPDATED: A few weeks ago Daily Billboard was a tad critical about the ad creative for the new movie Innocence, especially the blue filter used. 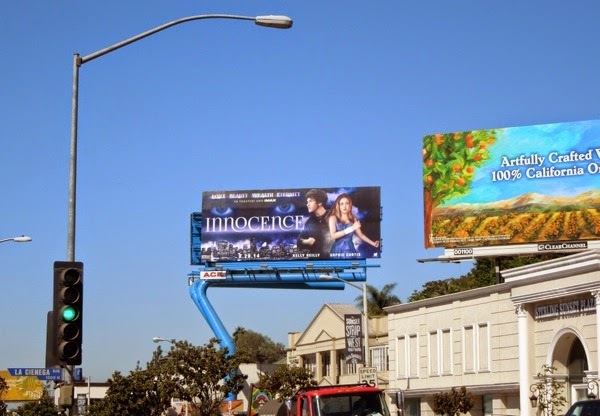 Well, it appears that the design gods were listening, as lo and behold we get another version of the billboard, this time with our young stars in glorious skin-tone colour. 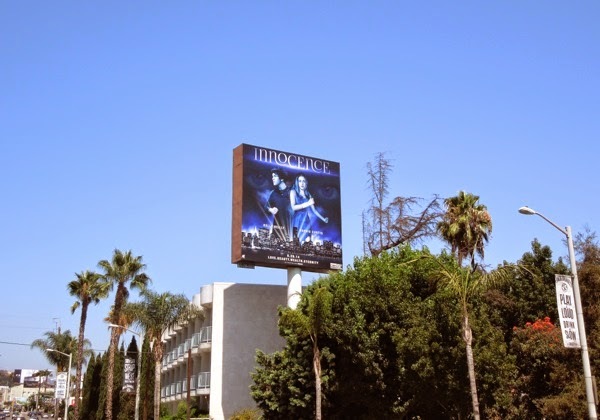 This updated billboard was spied westbound along L.A.'s Sunset Strip on August 5, 2014 (with the special extension billboard still on the reverse of this one). What do you think, it's a small change and the characters look less recessive, but is it an improvement in the grand scheme of things? We'll let you decide.